It’s a bean bag chair, no it’s a bed. Is it BOTH? I love versatile furniture, and this can be easily stored or used as a bean bag chair. This makes a great gift for kids or people who are moving into their first apartment or dorm room. It is also useful for giving your family members a place to sleep for the Holidays. On top of it’s function, these sacs look great and you will find that your household will fight over using it. The size is large enough for an adult and one kid, but really you want to keep it for yourself. I shot the above video over the course of about a month. You can see that I still don’t have the desired/expected results that I’m looking for. I plan on shooting a follow up video in a few months to see if it gets better. The first thought after looking at the product is that it is similar to a bean bag chair so you expect a bean bag feel. Well, that’s not what you are getting, as the material is a shredded Durafoam. This is the premium upgrade that is softer than the standard sactional filling. It is advised to let your sac expand and fluff it out for a day or two before you put the cover on it. Speaking of COVERS, this is where Lovesac separates from the pack. They offer 12 different covers in the quick ship category, and will really attempt to get you to purchase one of those. However, if you those 12 aren’t enough for you and you are willing to wait a bit you can choose from 192 cover options. Now, to make your life a little less complicated they will send you a swatch book with 5 materials. My understanding is that they will offer more variety in their swatch book soon. I picked the Owl Phur (which isn’t real FUR), because it really looks like an owl and well, I simply fell in love with the feel of it. Who Should Buy a Pillowsac? I’m not going to hide it, this is an expensive product. So, it won’t be for everyone. However, if you have the money to spend and want something that is stylish, functions as a super comfortable chair and can be converted into a bed, then this is for you. The bed function isn’t good enough for a full time sleeper, but your guests will rave about it. It is probably a bit “too nice” for a kid’s room, but once they are past the spilling, and jumping phase it would really fill out a teenager’s room. Of course, once they are headed off to college this would be a must for their first apartment. That’s where it would really shine, it will help people who are in their first apartment fill out a room and provide a much needed place for their friends to crash. If you are near one of the Lovesac 70 plus retail outlets in the US, you need to stop by and plop down on one of these. While you are there be sure to find the larger “BigOne” or the “Supersac” and dive onto them. Seriously, it is worth the experience, but you might want to do it when the salesperson isn’t looking. How do I Assemble a Pillowsac? The hard part is picking out the cover. From there assembly is easy, just fluff the sac a bit and throw on the cover, then zip. Then give the sac a giant plop down. If you are lucky you won’t bottom out/hit the floor. Fair warning be careful plopping on it. How BIG are the Lovesacs? How do I Get a Pillowsac? My pillowsac shipped in two stages. The duffle bag with the filler came before the cover. My understanding is that it takes some time for the compressed sac to expand so there is no real reason for the cover to make it to your house as quickly. Shipping time for my sac portion was about a week. You can repurpose the bag for something like storage or camping. If you want to get the sac back into the bag you need to get creative and vacuum out some air. This is a beast, it’s really a couch shaped like a bean bag chair. Fits a 4 person family. Since it is a bean bag foam constuction how does it sleep? The Kids love sleeping on it. I haven’t found a comfortable position yet. How long have you had the Pillowsac? I just bought it in October 2018, it arrived in 2 packages. 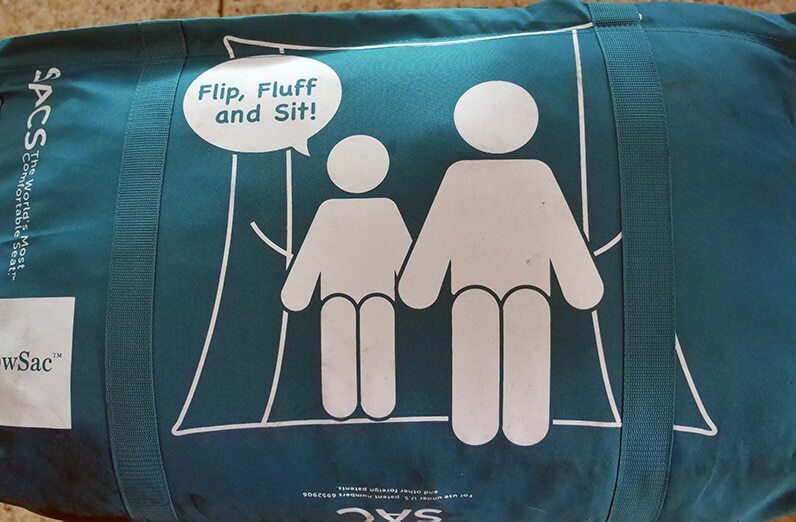 First you get the bean bag part, then you get the cover. This gives you a chance to air out the bag before you put it in the cover. Can You Add or Remove Foam? Yes, but if you have a stain that just won’t come out you can buy a new cover. Lovesac offers a generous 60 day trial period, for a full refund or exchange. Yes, all Sac inserts are guaranteed for life, and you can always change out the cover. How do I buy a Pillowsac?